IBC Blending System This IBC blending system integrates the functionality of a lift into one piece of equipment. 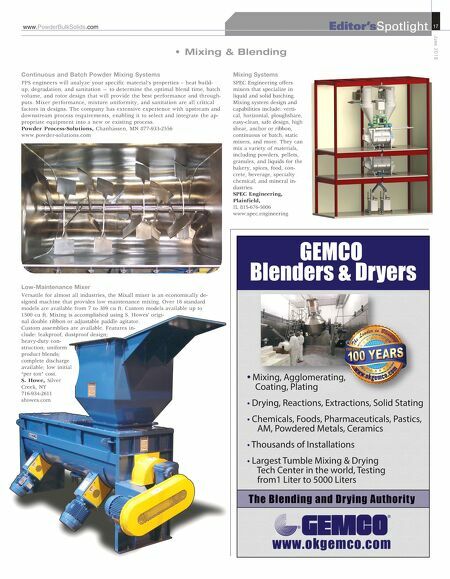 In addition to blending, the col- umn blender offers IBC-to-IBC transfers, gravity flow milling and sieving, and IBC lifting and placing. Typical use is for single suite manufacturing where the column blender is used to blend, then place and discharge the IBC into a tablet press or packaging ma- chine. The receiver allows for batch size flexibility ranging from 50 to over 2000 l. Other features include a ball screw drive vertical lift system and a ro- bust turret slew drive to assure precise positioning. An auto- mated control system features an operator-friendly color touch screen with easy set up and control features that eliminate the need to manually adjust stop point limit switches. Custom Powder Systems LLC, Springfield, MO 417-868-8002 www.custom-powder.com • Mixing & Blending Paddle and Pin Mixers Pin and paddle mixers are two mixing and blending models used for processing a wide range of materials. Paddle mixers, also known as pug mills, are optimal for various applications, including heavy-duty mixing and con- ditioning. They use a kneading and folding over motion to thoroughly blend materials. Paddle mixers are commonly used for processing materials such as municipal sludge, fly ash, and FGD sludge, as well as foundry dust, pigments, and even fertilizers and agricultural chemicals. Paddle mixers can be used as stand-alone units, or as a complement to a disc pelletizing system. Pin mixers use high-speed, rotational forces to blend, mix, and condition fine materials. They are often used for processing materials such as limestone, bentonite clay, coal dust, flue dust, and many others. Much like the paddle mixer, pin mixers can act as stand-alone units, or as part of a disc pelletizing configuration. Feeco International, Green Bay, WI 920-468-1000 www.feeco.com High-Sheer Agglomerator for Single-Unit Operation The Bepex FlexTurbulizer agglomerator is designed for single-unit operation to homogeneously mix multiple liquid and solid components on a continu- ous basis at high capacity, while also providing an agglomeration step to further enhance end-product value. Ideal for the feed additive and mineral markets—which traditionally rely on pin or paddle high-shear mixers—the FlexTurbulizer features a flexible, self-cleaning mixing chamber combined with a liquid delivery system. This technology can process materials that would otherwise build up in wet agglomeration processes. The proven FlexTurb agglomeration technology introduces enough energy into the mate- rial to create a strong, stable product. Applications include clay material for absorbents (cat litter), detergents, specialty chemicals, dyes and pigments, and particle coating. Bepex International LLC, Minneapolis, MN 612-331-4370 www.bepex.com Powder & Bulk Solids 16 Editor'sSpotlight J u n e 2 0 1 8 1943 2018 Anniversary Ph: 515.332.4045 chantland.com 761/#6+%#..;2.#%'n(+..2#2'4X2.#56+%n 21.;g918'012'0g/176*$#)5 7..;#&,756#$. '(14&+(('4+0)$#)5+<'5 *#0)'$#)5+<'5+0.'556*#0E/+076'9+6*176611.5 . '#45#('6;'0%.1574'(14126+/#.8+5+$+.+6; "Build quality equipment, and back it up." 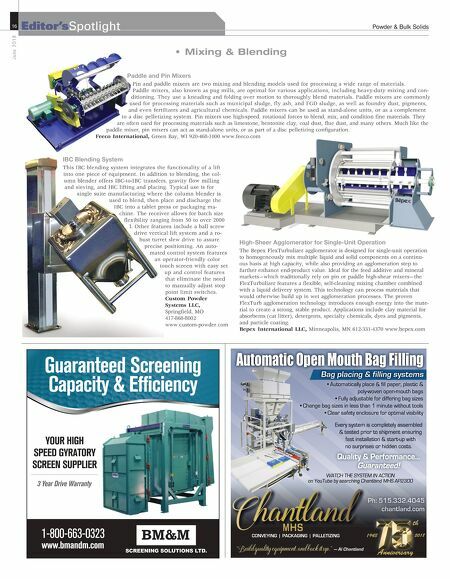 — Al Chantland Automatic Open Mouth Bag Filling Bag placing & filling systems M HS CONVEYING | PACKAGING | PALLETIZING 8'4;5;56'/+5%1/2.'6'.;#55'/$. '& n6'56'&24+14615*+2/'06'0574+0) (#56+056#..#6+10n56#46g729+6* 0157424+5'514*+&&'0%1565T 10177$'$;5'#4%*+0)*#06.#0&FGNN Quality & Performance... Guaranteed!